On February 27, 2018, the Board of Pharmacy Specialties (BPS) announced that Compounded Sterile Preparations Pharmacy has been approved as its twelfth specialty certification. Eligible pharmacists will be able to sit for the first BPS Board Certified Sterile Compounding Pharmacist (BCSCP) pharmacy certification examination in the fall of 2019. NOTE: The BPS content outline for the examination in Compounded Sterile Preparations Pharmacy refers to “knowledge of standards related to sterile preparation (e.g., United States Pharmacopeia…)”. [Domain 1, Task 2]. USP Chapter <797> Pharmaceutical Compounding – Sterile Preparations is in the process of revision. BPS examinations are based upon standards and guidelines that are current at the time of the examination. When changes are made in standards and guidelines, BPS incorporates these changes into examinations approximately six months after the change is released. This allows time for candidates to become familiar with new guidelines and for new guidelines or standards to be incorporated into BPS examinations. USP has announced that the new version of Chapter <797> is expected to be released on June 1, 2019 and will become effective December 1, 2019. The BPS Fall 2019 Compounded Sterile Preparations examination will be based upon the current version of USP Chapter <797> (2008). USP Chapter <800> Hazardous Drugs – Handling in Healthcare Settings is a new chapter published by USP in 2016 and originally scheduled to become official in December 2017. USP decided to delay the date of official implementation until December 1, 2019 in order to align the official implementation date of Chapter <800> with the implementation dates of two other related chapters. Since Chapter <800> has been available in final version since 2016, and since official implementation will be immediately after the Fall 2019 BPS testing window, USP Chapter <800> will be included on the Fall 2019 BPS Compounded Sterile Preparations Pharmacy examination. Please note that this guidance is to help eliminate confusion regarding USP Chapters <797> and <800>, and that there are other references that may be used in the CSP examinations. For the content outline for the BPS Compounded Sterile Preparations Pharmacy examination, click here. For updates and timelines on the status of revisions to USP Chapters, check this USP web page: https://www.usp.org/compounding/updates-on-standards. BPS Board Certification in Compounded Sterile Preparations Pharmacy program is a credential for pharmacists who have met the eligibility criteria and who in their unique practice are responsible for ensuring that sterile preparations meet the clinical needs of patients, satisfying quality, safety, and environmental control requirements in all phases of preparation, storage, transportation, and administration in compliance with established standards, regulations, and professional best practices. Supervise, train, and ensure competency of all personnel involved in sterile compounding. Pharmacists who, meet all of the eligibility criteria including passing the examination will be awarded the credential titled: Board Certified Sterile Compounding Pharmacist (BCSCP). Graduation from a pharmacy program accredited by the Accreditation Council for Pharmacy Education (ACPE) or program outside the U.S. that qualifies the individual to practice in the jurisdiction. *The 4,000 hours of experience required may be earned in a variety of settings. ASHP-accredited residencies that include practice hours in the activities listed in the Compounded Sterile Preparations Content Outline will be accepted as practice experience on an hour-for-hour basis. As of 2019, all applicants will be required to provide an attestation for practice experience from their employer, and the required practice hours must be demonstrated during the seven years prior to the application date. The experiential component is required to help assure practical application of components of the specialty knowledge being certified. There are multiple pathways to meet the practice experience requirement. Refer to the Compounded Sterile Preparations Pharmacy Content Outline for details. Compounded Sterile Preparations Pharmacy ensures that sterile preparations meet the clinical needs of patients, satisfying quality, safety, and environmental control requirements in all phases of preparation, storage, transportation, and administration in compliance with established standards, regulations, and professional best practices. 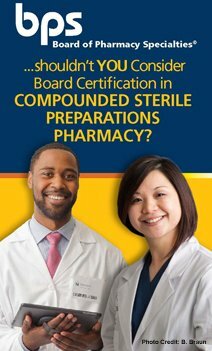 The first administration of the board certification examination in Compounded Sterile Preparations Pharmacy will be Fall 2019. * The 4,000 hours of experience required may be earned in a variety of settings. ASHP- accredited residencies that include practice hours in the activities listed in the Compounded Sterile Preparations Content Outline will be accepted as practice experience on an hour-for-hour basis. All applicants will be required to provide an attestation for practice experience from their employer, and the required practice hours must be obtained during the seven years prior to the application date. The first examination will be offered in Fall, 2019. The start date for the initial application period will be May 13, 2019. To maintain its strict, independent standards for certification, BPS does NOT provide review information, preparatory courses, or study guides. However, such materials may be available from outside organizations, state or local professional associations and colleges of pharmacy.